The royals are back in full swing this week, making visits, attending seminars, and hosting audiences. All of these events gave the ladies a chance to show off their jewels. Which look of the week is your favorite? 10. One queen contemplated another as Queen Margrethe II of Denmark viewed a bust of Queen Nefertiti of Europe during a visit to Berlin on Wednesday. 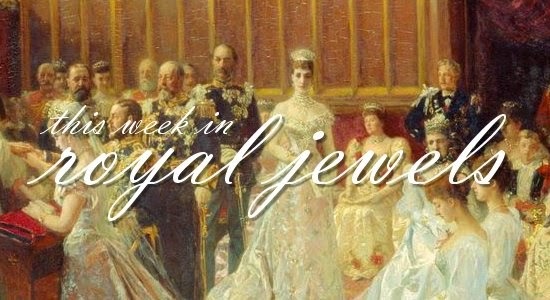 Margrethe chose a whimsical pair of golden earrings with colored center stones and a turtle-shaped brooch for the event, but let's be honest, who can out-jewel an ancient Egyptian queen? 9. On the first day of her German visit, Margrethe wore a pair of floral earrings and a diamond and sapphire brooch in the shape of an anchor. The brooch was especially appropriate, as Margrethe was visiting a replica of a Viking ship. It's also a piece with a long history; she's been wearing it for decades, though I don't believe its provenance is known. 8. In the Netherlands, Queen Maxima wore gold jewelry for a financial seminar on Thursday, including a gorgeous pair of golden butterfly brooches pinned to her shoulder. 7. On Tuesday, Crown Princess Mary of Denmark wore an absolutely stunning pair of pendant earrings set with bright blue stones while awarding a research prize at an art museum. 6. Crown Prince Haakon and Crown Princess Mette-Marit of Norway have been visiting Nordland this week. As many of the events were casual outdoor affairs, Mette-Marit wore minimal jewelry, but Wednesday's event gave us a glimpse of shiny stud earrings and a less-shiny bracelet. 5. On Monday, Queen Letizia wore her diamond and pearl pendant earrings to welcome President Varela of Panama to Zarzuela Palace in Madrid. 4. For the opening ceremony of the Invictus Games on Wednesday, the Duchess of Cornwall wore her pearl choker with the all-diamond clasp. (She also wore the same necklace the following day at a memorial service for her brother, Mark Shand.) Appropriately for the Games, she also wore the cap badge of The Rifles pinned to her jacket. 3. Pearls were Crown Princess Victoria of Sweden's jewel of choice on Tuesday while attending the celebrations for the Kammarkollegiet's 475th anniversary at the Royal Palace in Stockholm. 2. The Swedes went for higher-octane glitter on Monday at a dinner for the World Childhood Foundation. 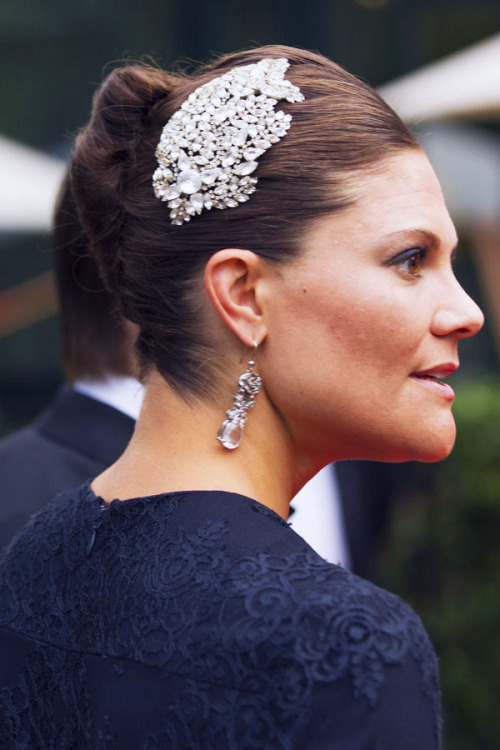 Crown Princess Victoria wore a sparkling hair ornament and earrings, while Madeleine chose dramatic black and silver earrings and Silvia wore a large pendant necklace. 1. 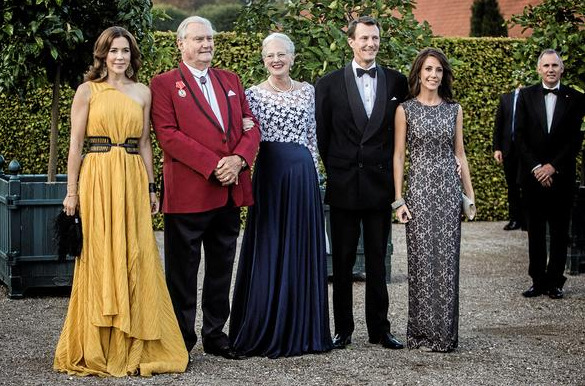 The Danish royals (sans Frederik, who is in Britain for the Invictus Games) brought out some glamorous accessories on Thursday at a dinner for the Red Cross at Fredensborg Palace. 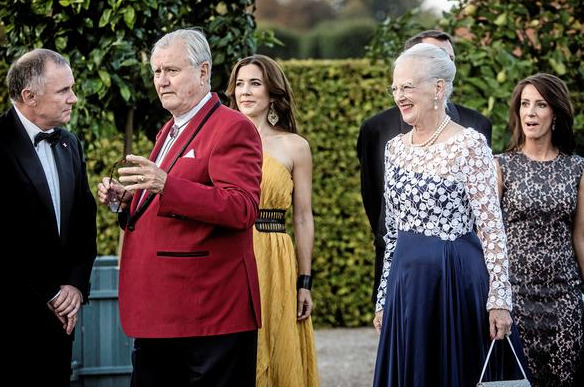 Queen Margrethe wore pearls, while Crown Princess Mary and Princess Marie both chose large cuff bracelets. Mary also wore dramatic feather earrings.